Here are a few photos I snapped this morning of my newly finished Monday Knight Productions model roads for miniature wargaming. At Fall-In 2009 I invested about $50 in purchasing a large quantity of flexible 1″ dirt roads from one of the vendors in the dealer hall. The roads were manufactured by Monday Knight Productions of Vancouver, Washington and come in three color selections (mine are the medium brown shade, which I like better for simulating roads of the Civil War era). The roads are made of latex and are durable and very flexible for undulating or hilly terrain layouts. I was never happy with the homemade roads I previously used, and I don’t like the cleanup required with laying down lots of fine grain brown flocking to represent roads, so these were a logical alternative. The Monday Knight products remind me of the old Scenic Effects flexible roads that a few of my gaming buddies use. Here’s a quick look at these roads, and my efforts to paint them and flock them to match my tabletop terrain. 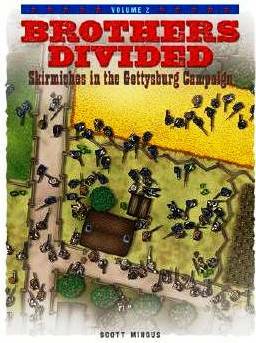 This is the tentative cover art for Volume 2 of Brothers Divided: Skirmishes in the Gettysburg Campaign, to be published in 2010 by Marek/Janci Design of Wheaton, Illinois. All the maps are completed, and the next step will be to do the interior graphic design and layout. Ivor Janci, the publisher and graphic artist, works on this wargaming scenario book in his spare time from his regular catalogue and advertising piece business. Hence, there is no set timetable for completing this fifth wargaming book we have collaboarated on in the past ten years. We expect to have it by Fall-In at the latest, but this is subject to change. I had the privilege of visiting Ivor and Frani earlier this month at their home and see a small portion of Ivor’s wonderful collection of wargaming figures and terrain. He’s very talented. This upcoming scenario book is designed for skirmish wargaming rules sets such as Ivor’s classic Brother Against Brother. The book contains a dozen small-unit actions from the Battle of Gettysburg. I liked the overall terrain of the this World War II tank game, and saw a couple ideas I can shamelessly steal for my 15mm Civil War layouts. One of the joys of large wargaming conventions is viewing all the other gamemasters’ terrain setups and incorporating new ideas into my layouts. 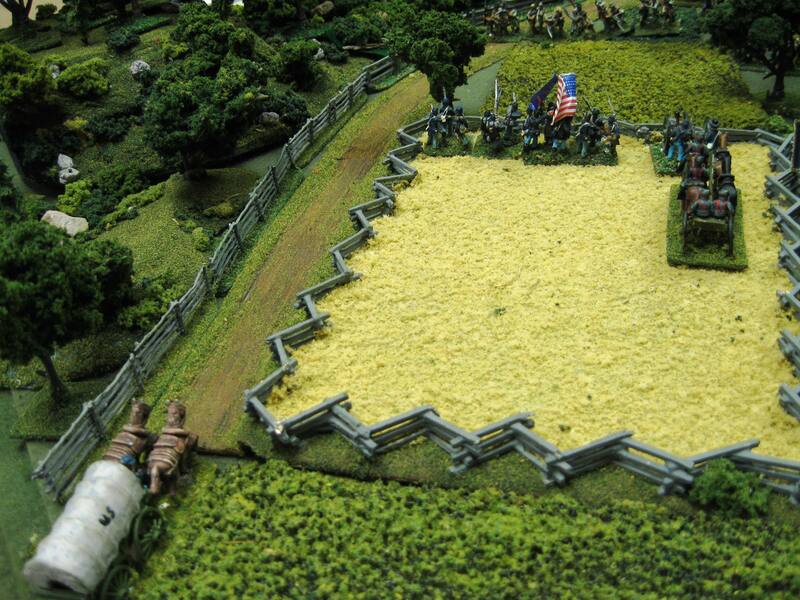 Here is a 15mm Johnny Reb 3 game presented by veteran New York gamemaster P. J. O’Neill. His sculpted terrain board was nice, and P. J. always runs a fun scenario. I attended the Fall-In convention at Gettysburg in early November and presented a 15mm wargame of my Johnny Reb 3 scenario for the Battle of Monocacy. During downtime after my game and before playing in some other Civil War games, I took a few random photos of other ACW games being played on other tables, both land battles (as shown above; I think this was a Fire & Fury game) and naval battles. I also snapped a couple of other games that I enjoyed watching. Here’s a nice little 1:600 Confederate fort in one of the many Civil War naval games being played at this year’s Fall-In. Union Naval guns were trying to silence the bastion, with some success. 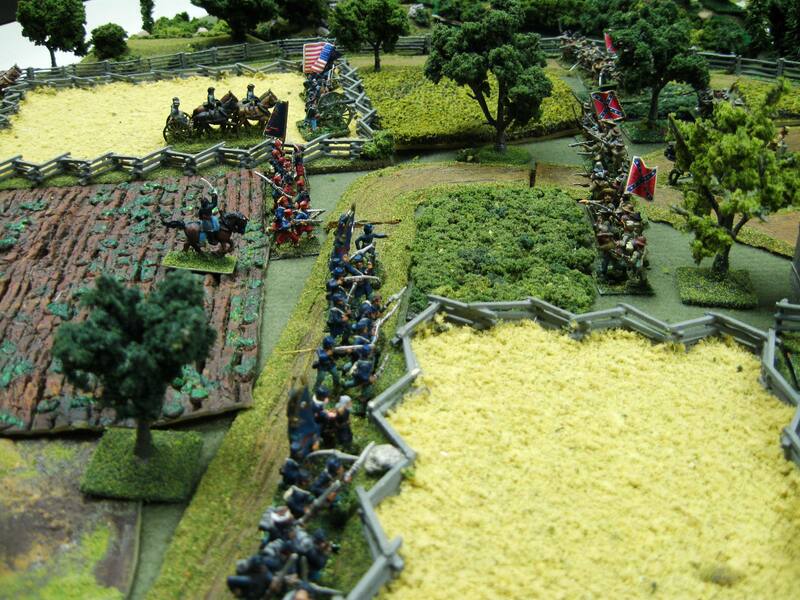 Thomas Smyth’s brigade of the Union II Corps prepares to move out to seize the Bliss Farm in this portion of a miniature wargaming layout by veteran gamemaster and rules author Jim Kopchak of Parma, Ohio. Jim is an old friend of mine, having played in several of my playtests of what became my Enduring Valor: Gettysburg in Miniature scenario books. 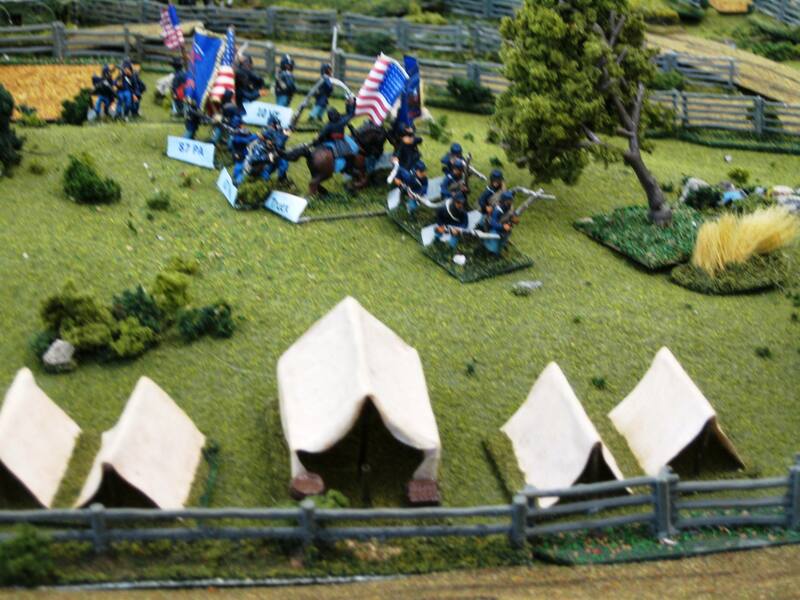 While designed specifically for Johnny Reb 3, the popular scenarios can be readily combined, modified, or otherwise adapted for other rules systems, including Jim’s Civil War Commander rules. At Fall-In 2009 in Gettysburg, Jim presented a game based upon a couple of scenarios from Enduring Valor, Volume 2 from the July 2, 1863 attack by James Longstreet’s Confederate forces upon the Union line on Cemetery Ridge from the Spangler farm northward to the outskirts of Gettysburg. Part of the Union VI Corps line along the Georgetown Pike. This is Truex’s brigade in action defending the turnpike against the Louisiana Tigers. 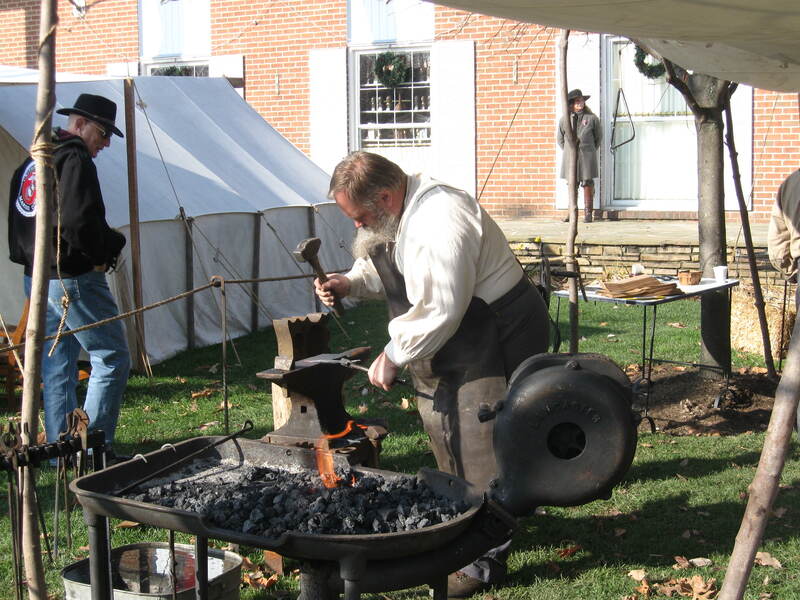 The veteran 8th Illinois Cavalry is in the foreground. I ran a 15mm miniature wargame of the Battle of Monocacy at the annual Fall-In convention in Gettysburg on November 5. The rules were Johnny Reb 3, and the scenario featured three Union players (1 brigade of Lew Wallace’s army and 2 brigades of the VI Corps of the Army of the Potomac) against five Confederate players (John B. Gordon’s division, McCausland’s brigade of dismounted cavalry, and one of Rodes’ brigades). The Confederate right flank is shown here (Clement A. Evans’ brigade of Georgians). The scenario was written by author and wargamer Scott L. Mingus, Sr. and appears in the current issue (#25) of the CHARGE! newsletter, published each quarter by the Johnny Reb Gaming Society. Author and blogger Scott L. Mingus, Sr. stands in front of one of dozen or so World War II and World War I tanks that on the grounds of the First Division Museum at Cantigny, a fascinating free museum in Wheaton, Illinois. I am in Chicago on business this week while visiting suppliers and customers and speaking at the Specialty Papers Conference 2009. I took an afternoon to meet with my good friend and long-time wargame scenario book publisher Ivor Janci and his charming wife Frani. Ivor and I toured the First Division Museum, which is on the grounds of the estate of millionaire newspaper baron Robert R. McCormick, who owned the Chicago Tribune and became known prior to World War II for his isolationist ideals. During the first world war, he served in the 1st Battery, 5th Field Artillery Regiment, with the First Infantry Division and served in several battles, including Cantigny in northern France. He later named his sprawling estate for the battle and the grounds now house the wonderful First Division Museum. The museum boasts several excellent walk-through dioramas featuring “The Big Red One” in action in World War I in the trenches, in World War II at D-Day and the Battle of the Bulge, in the jungles of Vietnam, and in Desert Storm.